Mars Global Surveyor (MGS) entered Mars orbit on 12 September 1997. Today, we celebrate the MGS's 8th anniversary! The 8 Earth years that MGS has been in orbit span portions of 5 martian years. 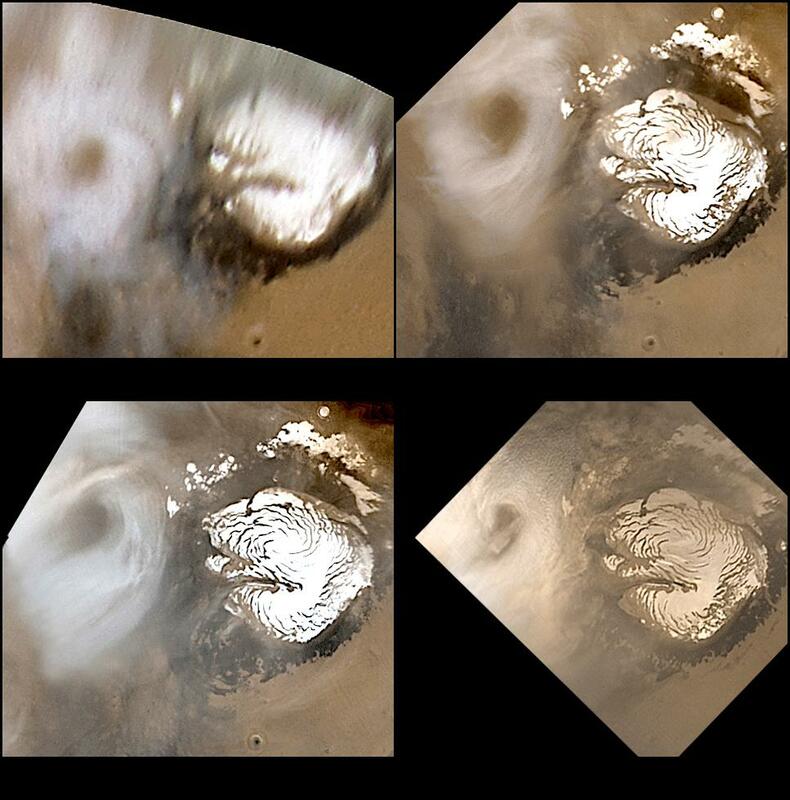 One of the critical science activities that the Mars Orbiter Camera (MOC) has been engaged in for the past 8 years has been to document daily changes in the martian weather. Each day that MOC is operating, the red and blue wide angle cameras are used to build up a daily global map. These maps provide a record of the planet's changing meteorological conditions. One of the most exciting observations that the MOC wide angle cameras have made during these 8 years is that the red planet has very repeatable weather patterns. In light of weather-related problems and disruptions that occur every year on Earth, one can only imagine how nice it would be if our planet followed a similar, repeated pattern. 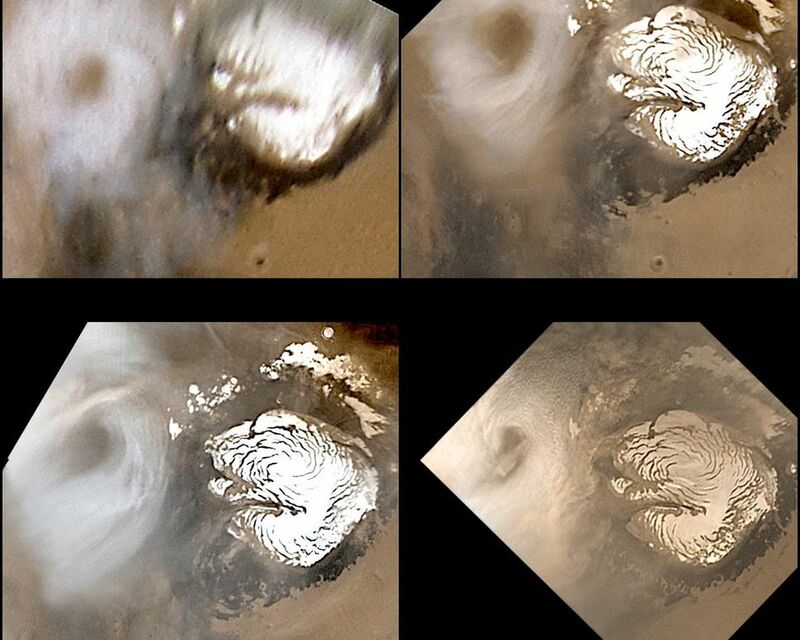 The four pictures shown here provide an example of one of the weather phenomena that repeat each martian year. 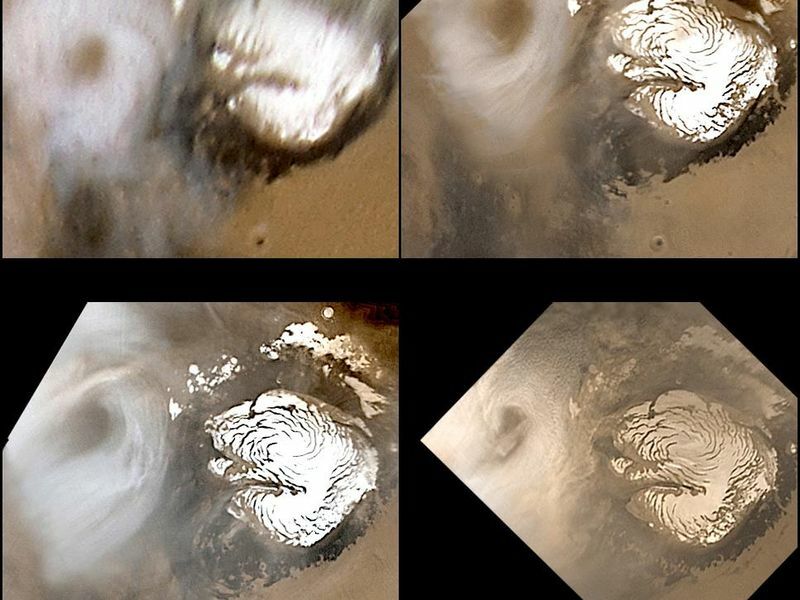 Each picture shows the north polar region of Mars during the northern summer season. Each picture is a composite of several images acquired at different visible wavelengths to give a color view of the planet. Each picture was taken about 1 Mars year apart, and each shows an annular (circular) cloud located over the same terrain each summer. The first picture, acquired in April 1999, is actually not from the MGS MOC instrument. It was obtained by the Hubble Space Telescope (HST) Wide Field Planetary Camera 2 (WFPC2) and was originally released by the Space Telescope Science Institute on 19 May 1999. The reason there is no MOC image for April 1999 is a product of the MGS spacecraft's 8-year history at Mars. MGS was certainly in orbit at the time, and it was taking data during the month of April. However, the camera did not obtain any images between 17 and 28 April because the spacecraft encountered, and then had to be recovered from, a problem. It was at this time that the spacecraft team realized that there is something obstructing the full movement of MGS's high gain antenna. A work-around was created and the mission has continued, ever since, but the down-side was that MOC did not have the opportunity in 1999 to provide detailed observations of the north polar, summertime, annular cloud. 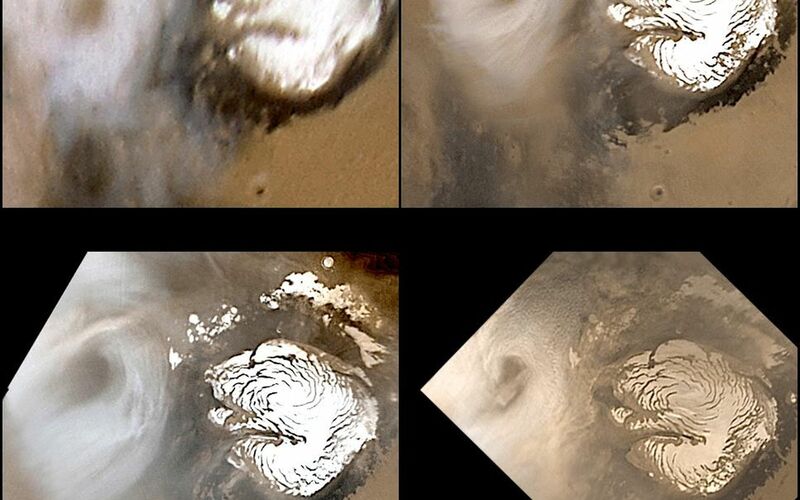 The remaining three pictures show MGS MOC views of the cloud feature, as it appeared in the subsequent 3 Mars years. Each year, the cloud appeared at about the same time or slightly earlier than in the previous year. Despite its superficial resemblance to a hurricane or cyclone on Earth, the northern summer annular cloud does not rotate. The cloud forms as different currents of air merge in the morning hours in the polar region; by afternoon, the annular cloud typically dissipates or breaks up into smaller clouds. MGS MOC has observed other repeated phenomena over the course of its 8-year mission orbiting Mars. These include dust storms that repeat, year after year, in the same location within a week or two of the time it occurred in the previous year. They also include dust devils in northern Amazonis, which start up shortly after the first day of spring, and keep occurring nearly every afternoon until a few days into the autumn season. MOC is continuing its mission to monitor the planet -- in 2006, MOC's weather observations will be used to provide guidance for the aerobraking maneuvers of the Mars Reconnaissance Orbiter (MRO). MOC images will show whether dust storms are occurring, and whether the dust suspended by these storms will impact the density of the atmosphere at the altitudes that MRO is passing through to slow the spacecraft and change its orbit to the one desired for the MRO primary mission.